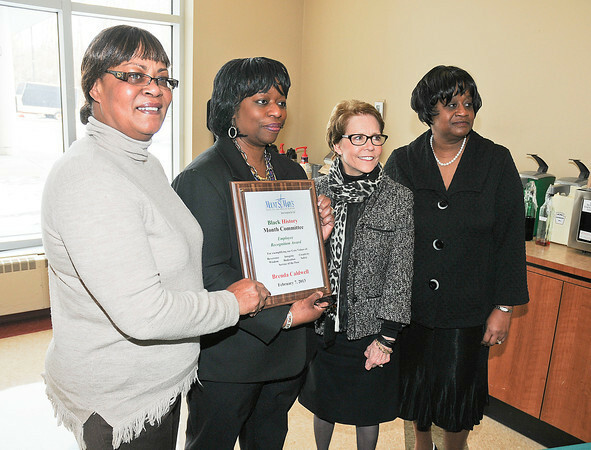 James Neiss/staff photographerNiagara Falls, NY - Nursing Supervisor DeLois Wooten, left, presents a plaque to Laboratory Services employee Brenda Caldwell for Black History Employee Recognition, along with President and CEO Judith Maness and Rev. Joanne Scott. Mount St. Mary's Hospital and Health Center celebrated Black History Month with a ceremony on Thursday.